Sage last night provided an update to Sage 100 ERP v4.5 in the form of Sage 100 ERP v4.5 product update 4. A quick glance through the “What’s Fixed” list shows a few bug fixes but nothing that seems major. IMPORTANT NOTE – JULY 6, 2012: When the original product update 4 was released some users reported an issue when migrating data (which is a different process than converting) from versions prior to 4.5. Sage quickly fixed this issue and replaced the original product update 4 download with a new version. So if you’d previously downloaded the update but have not yet applied it – we recommend that you discard the old product update 4 and re-download. If you’re not experiencing a problem that this update say’s is now fixed – we recommend following the “If it isn’t broken don’t fix it” theory of installing patches. However if you are experiencing an issue the product update claims to solve – please be sure to talk with your Sage partner about whether it’s safe to implement this update. If you have custom enhancements or integrations to your Sage 100 ERP it’s best to verify compatibility BEFORE installing any upgrades or product updates. The following is a list of enhancements and corrections that have been incorporated for Sage MAS 90 and MAS 200 version 4.50 in this Product Update. Product Updates are cumulative, containing all program corrections found in prior updates. Product Update 4.50.4.0 also contains program corrections that were included in 4.40.0.7 – 4.40.0.9. These are also listed below for reference. The numbering scheme has been changed for 4.50 Product Updates. The third segment represents the Product Update number. This change was done to accommodate future enhancements. 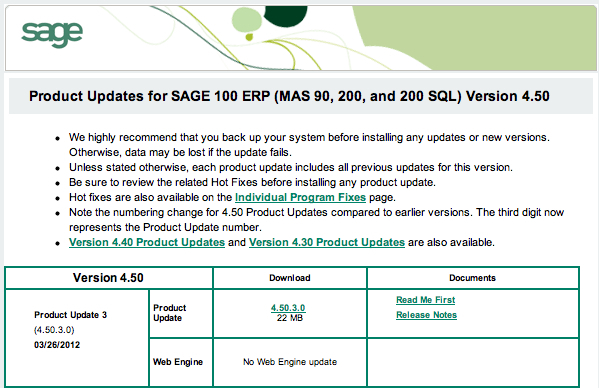 Sage have just released product update 3 for Sage 100 ERP (formerly Sage ERP MAS 90 and 200). This update provides for bug fixes to various modules (read the complete fix list here). Payroll users can obtain an updated 941 2012 form by downloading and installing this update. (Tip: Always check with your technology advisor prior to installing any updates). In form printing, form codes are no longer duplicated after migrating from an installation prior to 4.40.0.6. Sage have posted the first product update for their latest MAS90 4.5 release. This product update includes a very helpful section which provides information on what files are converted (if any) when you load the product update. Previously there was no way to know if a lengthy data conversion was going to kick off or if the product update might impact a customization that was installed on your system. The new changelog (view here) provides these details and should be helpful when deciding on the timing of the installation. Sage have just posted an update about the expected timing of the next Product Update for Sage ERP MAS 90 and MAS 200. 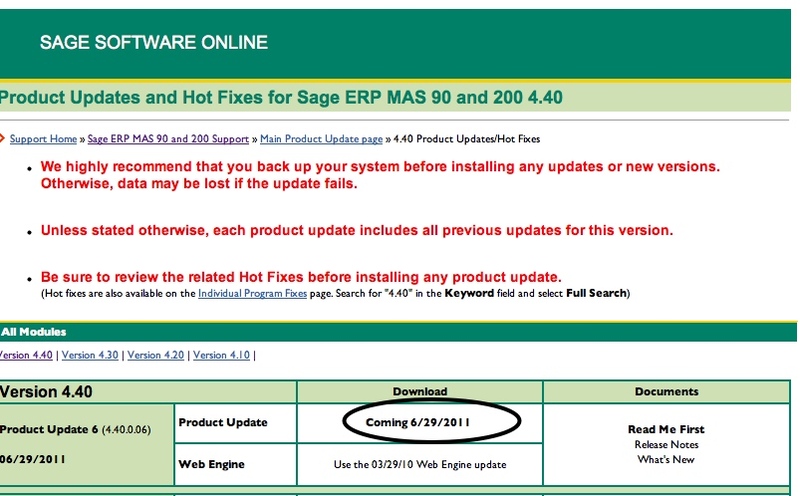 According to the Sage support site you will be able to download Product Update 6 on June 29, 2011. Among the planned enhancements are the addition of 7 Extended Solutions and some fine tuning of printers so that each printer preferences is now saved by workstation. Here’s a quick tip as we enter the busy year end time. When you are upgrading your MAS90 or MAS200 ERP software – be sure that after you install the latest product updates that you go back to this chart and download all the hot fixes. 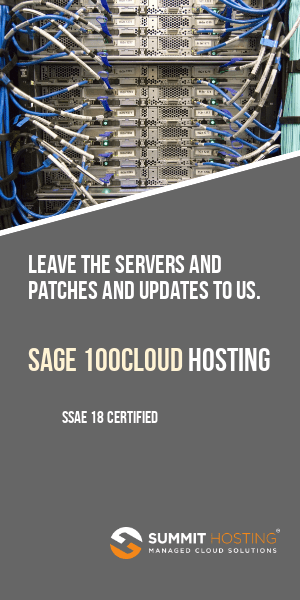 Sage issues one product update (the last was product update 3 dated 9/27/10) which contain a whole slew of new features as well as bug fixes (read about the MAS90 & MAS200 product update 3 features here). What many users who self-install the product updates don’t realize is that Sage does not automatically keep the product update bundle updated for any subsequent fixes. So if you install Product Update 3 and there’s a bug fix issued you must manually add that fix (termed a Hot Fix) to your system. The first thing you’ll want to do is read here about how to tell which MAS90 hot fixes have already been installed. Then navigate online to this link and download any (or all) of the hot fixes you deem required.